Dark Tides Rising, the first of the four-part Transylvania Chronicles, takes characters on the ride of their unlives--through the epic annals of Cainite history. Coteries play vital roles in the Nosferatu Zelios' titanic struggle to bind dread Kupala, in treacherous Goratrix' return to the Tremere's Ceoris chantry and in the Anarch Revolt itself. 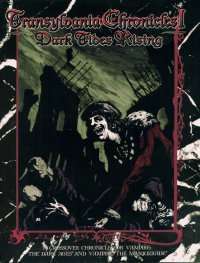 The Transylvania Chronicles cross over with Vampire: The Masquerade and span 800 years of Cainite and mortal history. Players now have a chance to make history.